You can click on the wrestler’s name above to go to their profile if I have one here on Joshi City. While this event was not filmed for TV, the matches all still got a decent amount of time so this is not your average house show. There is only one camera but its being operated, so its not just a static hard cam setup. We start off with a rookie vs. veteran match, a staple in Japanese promotions. Yuina is a rookie from REINA, she debuted last January and is still progressing, she hasn’t accomplished anything of note yet. KAZUKI is JWP wrestler and a near 20 year veteran, so the winner here is not in doubt but hopefully Yuina will get a chance to impress. KAZUKI and Yuina tie-up to start, elbows by Yuina but she can’t knock KAZUKI off her feet. They trade wristlocks, headlock by KAZUKI and she takes the rookie to the mat. Yuina struggles to the ropes to force a break but KAZUKI throws her down by the hair and scoop slams her for a two count cover. Leglock by KAZUKI and she applies a camel clutch, after a moment she releases the hold and knees Yuina in the back. Irish whip by KAZUKI but Yuina hits a crossbody, stomps by Yuina and she applies a chinlock. KAZUKI gets out of it and hits a scoop slam, running knee drop by KAZUKI and she covers Yuina for two. KAZUKI puts Yuina into the corner and hits a series of knees, KAZUKI charges Yuina but Yuina moves and hits a dropkick. Yuina and KAZUKI trade elbows, Yuina elbows KAZUKI against the ropes but KAZUKI knees her in the stomach. Dropkick by Yuina and she hits a seated senton, picking up a two. Yuina picks up KAZUKI but KAZUKI hits a scoop slam before putting Yuina in a crab hold. Yuina gets a hand on the ropes to force the break, running knee to the back by KAZUKI and puts Yuina across the second rope in the corner. Kneedrop by KAZUKI from the top turnbuckle, she then goes back up top and delivers a reverse splash kneedrop, but Yuina kicks out of the cover. KAZUKI goes up top again but this time Yuina avoids her dive and hits a bridging vertical suplex for two. Yuina gets on the second turnbuckle and hits a diving seated senton, but it only gets a two. Yuina goes off the ropes, KAZUKI picks her up but Yuina slides away and sneaks in a sunset flip. Yuina tries an inside cradle and backslide as well with no luck, KAZUKI scoops up Yuina and tosses her onto the mat. Crab hold by KAZUKI but Yuina gets into the ropes, STF by KAZUKI but again Yuina is able to force the break. KAZUKI picks up Yuina and hits a backdrop suplex, she goes up top and she delivers the diving kneedrop for the three count pinfall! KAZUKI is your winner. I normally say matches are too short, but this one felt like it had a bit too much time. They didn’t have a ton of interesting things to do so the match just felt like it dragged even though it only went ten minutes. I do not know if Yuina has a future in Joshi but nothing from this match gave me any reason to think she will be a star, although KAZUKI is a tough draw as she isn’t the ideal pairing for a rookie due to her straight-forward and bland style. No mistakes or awkwardness, it was just a bit listless and dull. Let’s see if my love of all things involving Syuri overcomes the fact nothing else from this looks exciting. Nakamori is a ten year veteran but has had little success in her career, only having any luck in the tag division. 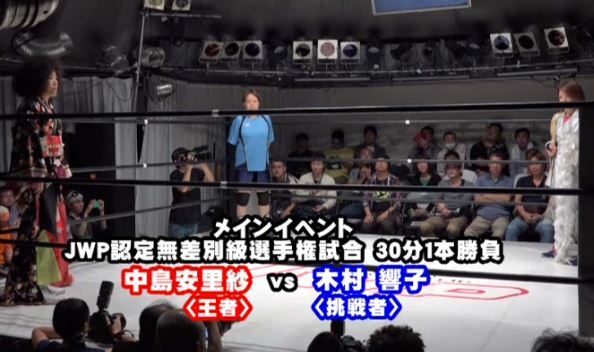 Natsu wrestles in WAVE, she is still young but like Nakamori is awkward in the ring and has to make some improvements before she can really climb up the card. Syuri is one of my favorite wrestlers, she is a legitimate MMA fighter (3-0 in 2016) and the total package. Fujigasaki is 19 years old and has really improved a lot this year, she may be someone to keep an eye on as she gets a little better every time I see her. Syuri and Nakamori kick things off, Irish whip by Syuri but Nakamori shoulderblocks her to the mat. Armdrag by Syuri but Nakamori hits an armdrag of her own and both wrestlers return to their feet. Running kick by Nakamori but Syuri gets up and kicks her back, they trade snapmares and kicks which Syuri naturally gets the better of. Fujigasaki runs in and they double team Nakamori, Syuri hops on Fujigasaki’s back but Nakamori rolls out of the way of the body press attempt. Nakamori tags in while Syuri yells at Fujigasaki, Syuri tags Fujigasaki but Natsu promptly attacks her. Natsu and Nakamori double team Fujigasaki in the corner, Nakamori is tagged in and she hits Fujigasaki with a leg drop. Fujigasaki is beat down for awhile, first by Nakamori and then by Natsu, Natsu boots Fujigasaki repeatedly before covering her for two. Figure Four Necklock by Natsu but Fujigasaki gets to the ropes to force a break, running boot by Natsu but Fujigasaki hits a hip attack to start her comeback. Missile dropkick by Fujigasaki and she makes the tag to Syuri, knees by Syuri to Natsu and she hits a running knee in the corner. Double underhook suplex by Syuri and she puts Natsu in a cross armbreaker, Natsu gets out of it but Syuri hits a PK for a two count. Fujigasaki comes in, Syuri gets on her back and they walk over Natsu a few times before Fujigasaki hits a body press. Cover by Syuri, but Natsu kicks out. Syuri goes off the ropes but Natsu hits a jumping lariat, boot by Natsu and she hits a Bronco Buster in the corner. Bridging suplex by Natsu, but Syuri kicks out at two. Natsu goes up top and hits a diving crossbody, she tags in Nakamori and Nakamori boots Syuri in the head. Kicks by Nakamori but Syuri kicks her back and hits a release German. Nakamori springs to her feet and quickly hits a Shining Wizard, she goes up top but Syuri avoids her dive and kicks her in the chest. German suplex hold by Syuri, but Natsu breaks it up. Syuri tags Fujigasaki, Fujigasaki goes up top and she hits a missile dropkick. Fujigasaki goes up again and hits a second missile dropkick, cover by Fujigasaki but it gets a two count. Fujigasaki hits rolling double wrist-clutch suplexes, but Nakamori kicks out of that as well. She goes for another one but Nakamori blocks it, kick to the stomach by Nakamori but Fujigasaki blocks the fisherman suplex. Scoop slam by Fujigasaki, she goes up top but Nakamori gets her knees up when Fujigasaki dives off. Natsu runs in and kicks Fujigasaki, big boot by Nakamori and they drop Fujigasaki with a double lariat. Nakamori picks up Fujigasaki and delivers the fisherman suplex hold, but Fujigasaki barely gets a shoulder up. Nakamori goes up top but Syuri kicks her from the apron, this gives Fujigasaki time to recover and Fujigasaki joins Nakamori before suplexing her down to the mat. Fujigasaki picks up Nakamori but Nakamori kicks her in the stomach, Syuri runs in but so does Natsu to even the odds. Fujigasaki covers Nakamori with a jackknife for two, she tries a few other flash pins but nothing works. Syuri returns and kicks Nakamori in the head, sunset flip by Fujigasaki but Natsu breaks it up. Fujigasaki goes off the ropes but Nakamori hits a big boot, Shining Wizard by Nakamori but Syuri breaks up the cover. Nakamori goes up top and she nails the Destiny Hammer, picking up the three count! Hanako Nakamori and Sumire Natsu are your winners. Its hard to describe in words why this match is so bad. I’d say “you’d have to watch it to understand” but I don’t want you to have to watch it to understand. It was just really disjointed and basic, there were times they clearly didn’t know what was going on and besides Syuri all of their default moves were “running kick.” Not a big boot, just running up and kicking their opponent in the stomach. There were so many of those, and its not a real move, its a filler/confusion move that is just really obvious. So there was a lot of that, no real story being told, nothing to tie everything together. Syuri was fine as always but there was no way she could save this match, Nakamori I don’t think will ever develop as this is normal for her, Natsu hopefully will but for me they are a tag team from hell as I don’t think they could have an entertaining match as a team. Anyway, don’t watch this, even if you love Syuri you’ll come away from it annoyed. I am remembering why I don’t usually watch JWP. I got this event for the main event but it is going to be a hell of a slog to get there. Katsu is a three year veteran of JWP, she is also a pretty average wrestler that still has some growing to do, even though JWP is pushing her pretty hard due to the fact they have a small roster. Hagane is four years into her career, she held the Jr. Championship earlier in the year (Jr. meaning a younger wrestler) and is solid, but not someone you’d count on to carry a match. We’ll see how they mesh, since both are JWP wrestlers they should have good chemistry together. They start with a shoulderblock battle that Hagane gets the better of, Hagane throws Katsu into the corner and she hits a lariat for a two count. Scoop slam and a running body press by Hagane and she puts Katsu in a camel clutch. Katsu gets out of it and bites Hagane’s arm, kicks by Katsu and she slams Hagane’s head into the mat before putting Hagane in a camel clutch of her own. Katsu rolls it into a bodyscissors, Hagane gets out of it and they trade elbows back on their feet. Katsu goes off the ropes but Hagane catches her with a swinging backbreaker, Hagane applies a single leg crab hold but Katsu gets to the ropes. Hagane picks up Katsu but Katsu knees her in the back and applies a crab hold but Hagane forces the break. Katsu goes up top and hits a missile dropkick, covering Hagane for two. Katsu picks up Hagane but Hagane elbows her off, snap release German by Katsu and she hits a Reverse Splash. Katsu goes for a second one but Hagane gets her feet up, Samoan Drop by Hagane and she hits a Reverse Splash of her own. Another Reverse Splash by Hagane, but Katsu kicks out of the cover. Hagane goes up top again and this time hits a diving bodypress, but Katsu barely gets a shoulder up. Hagane picks up Katsu but Katsu slides down her back and applies a sunset flip, Katsu goes off the ropes and hits a jumping knee by Hagane for a two count. Katsu picks up Hagane, Hagane goes for a Rainmaker but Katsu blocks it and both wrestlers elbow each other. Lariat by Hagane, she picks up Katsu and she delivers the Rainmaker, but Katsu barely kicks out. Hagane goes off the ropes but Katsu catches her with a spinning back elbow, German suplex hold by Katsu but it gets a two count. Katsu goes up top and she hits a diving elbow drop, Katsu picks up Hagane and sits her on the top turnbuckle. Katsu joins Hagane and hits an avalanche release Orange Blossom suplex, she follows that with the regular Orange Blossom and she picks up the three count! Manami Katsu is the winner! Diana wrestler Sareee joins three JWP wrestlers for a unique semi-main tag team match. Bolshoi and Leon have been wrestling forever and hold down the midcard of JWP, neither are serious threats for the Openweight Championship but are still very entertaining and regularly put on good matches. Miu is in her fifth year but is retiring soon, while Sareee is also in her fifth year. Both of them are only 20 years old as they started wrestling very young. As long as they don’t coast through it, this has the potential to be a fun match. Leon and Bolshoi start off the match, Leon goes off the ropes as Bolshoi does as well and Leon hits a tilt-a-whirl backbreaker. Sareee comes in, Bolshoi goes for a double crossbody and is assisted by her partner Miu. All four stay in with Bolshoi and Miu getting the advantage, vertical suplex by Bolshoi to Leon and she covers her for two. Camel Clutch by Bolshoi, she lets the hold go and tags in Miu. Cutter by Miu and she snaps Leon’s arm, she throws Leon into the corner but Leon jumps over her head and dropkicks Miu into the corner. Leon tags in Sareee, scoop slam by Sareee to Miu and she puts her in a the Muta Lock. She picks up Miu as Leon comes in, and they both hit a dropkick. Miu changes the momentum with an armdrag and a crossbody, giving her a chance to tag in Bolshoi. Bolshoi gets Sareee on her shoulders and stretches her, dropkick to the knee by Sareee and she rolls up Bolshoi for two. Sareee charges Bolshoi but Bolshoi applies a hanging armbar, she tags Sareee’s arm and walks the ropes while Miu does the same to Leon in the opposite corner. They both hit armdrags off the ropes, more double team moves by Bolshoi and Miu as they are dominating their opponents. Miu stays in with Sareee and stretches her on the mat, Sareee gets out of it and the two trade elbows. DDT by Miu, she goes up top and she hits a missile dropkick for a two count. Sareee elbows Miu away and hits a dropkick, another dropkick by Sareee and she hits the fisherman suplex hold for a two count. She rolls to her corner and tags in Leon, running shoulder tackle by Leon in the corner but Miu gets out of the double underhook. Another shoulder tackle by Leon, she goes up top and hits the missile dropkick for two. Leon goes up top but she is grabbed from the apron, Miu joins Leon but Sareee suplexes her from behind. Leon delivers a rope walking dropkick, cover by Leon but Miu kicks out. Stunner by Miu and she hits a lariat, picking up a two count cover. Miu goes off the ropes but Sareee kicks her from the apron, Sareee comes in but Miu hits a DDT on Leon anyway. Sliding D by Miu and she tags in Bolshoi. Bolshoi picks up Leon but Bolshoi catches her when she goes off the ropes and applies an armbar. Leon gets out of that but Bolshoi quickly puts her in another submission until Sareee breaks it up. Leon spears both of her opponents, she goes up top but Bolshoi avoids the dive. Leon lands on her feet and drops Bolshoi with a tilt-a-whirl slam, Sareee goes up top and she delivers a diving bodypress. Leon then does the same, but Miu breaks up the cover. Leon picks up Bolshoi but Bolshoi pushes her away, Miu tries to help but she elbows Bolshoi by accident. Heel kick by Leon to Bolshoi, but Bolshoi barely kicks out of the cover. Bolshoi reverses the Capture Buster into an inside cradle for two, palm strike by Bolshoi but Sareee runs in and dropkicks her. Miu takes care of Sareee, Tiger Feint Kick by Bolshoi to Leon and she rolls up Leon for two. Bolshoi charges Leon but Leon pushes her away and applies a jackknife for two. They trade quick pins with neither getting the win, Bolshoi goes for La Magistral but Leon blocks it and puts her in the Clutch de Gao for the three count! Leon and Sareee win! Arisa won the belt on April 3rd, 2016 against Mayumi Ozaki, but this is only her second defense of the title. Kyoko is a Freelancer but regularly wrestles in JWP, especially since the summer. She already announced she is retiring in January, but has had quite a bit of success in a variety of promotions leading up to the end of her career. In fact, coming into the match Kyoko already holds the JWP Tag Team Championship with Nakamori, and with a win here will hold both of JWP’s major championships. Kyoko quickly gets Arisa to the mat after the bell rings and the two jockey for position, they get back up but reach a stalemate. They slow down as they trade holds while still on their feet, they soon start trading elbows before Kyoko flings Arisa out of the ring by her hair. Kyoko goes out after her and they trade elbows out on the floor, our vision is blocked by what is happening however since the crowd is standing. Kyoko apparently won the battle as she returns to the ring first, she kicks Arisa as she returns and starts working on her arm. Arisa ducks Kyoko’s big boot attempt and hits the Sling Blade, running boot by Arisa and she hits a missile dropkick off the top turnbuckle. Arisa goes back up top and hits a second one, cover by Arisa but it gets two. DDT by Arisa, she goes for a suplex but Kyoko grabs the ropes to block it. Arisa goes for an elbow but Kyoko catches her arm and applies a short armbar, Arisa briefly gets out of it but Kyoko re-applies the hold. Arisa gets a foot on the ropes to break the hold, kicks by Kyoko and she snaps Arisa’s arm over the top rope. Kyoko gets back in the ring and applies a keylock, but Arisa forces the break. Kyoko tries to get Arisa to the mat but Arisa blocks it, she goes for a big boot but Arisa catches her leg and applies an ankle hold. Kyoko rolls out of it and applies an ankle hold of her own, but Arisa reverses it back again. Kyoko gets to the ropes to force a break, running boots to the head by Arisa and she goes up to the top turnbuckle, but Kyoko bumps the ropes before Arisa can jump off. This event started really slow and I was getting pretty depressed about spending money to get it, but once Hagane and Katsu snapped it got a lot better from then on. Leading up to the main event there was some solid wrestling but it didn’t go beyond that, while the tag matches were fun they were your typical midcard tag matches that keep the crowd entertained but don’t do anything too memorable. The main event was entertaining, I was afraid it would feel too long but it didn’t as the veterans managed to keep it interesting for the 23 minutes. 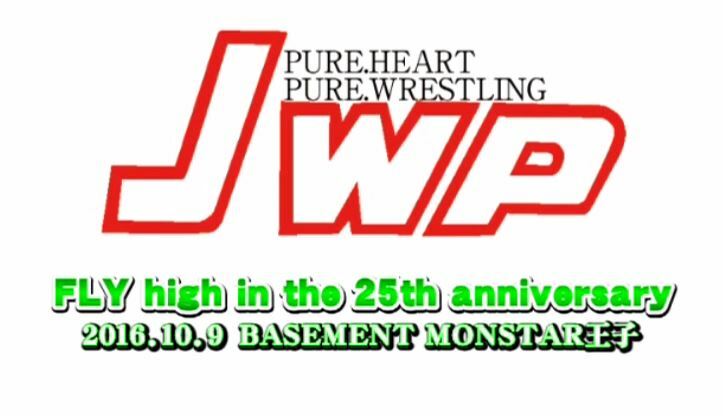 Some long term selling type issues aside, it was a hard hitting match that is worth a watch for fans of JWP. Top to bottom I’ve seen worse cards, I wish the first two matches had been better but the show was mostly redeemed by a better second half and a quality championship match.